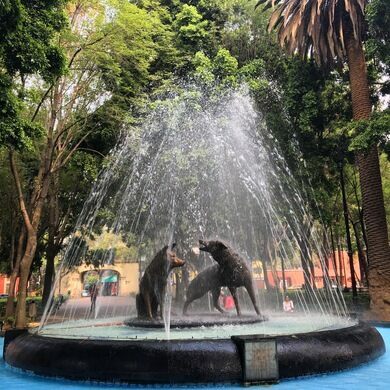 In the center of the lovely Parque Centenario in the Coyoacán borough of Mexico City stands a bronze statue fountain portraying a pair of beautiful coyotes surrounded by jets of water. Created in 1967, this public artwork makes reference to the etymology of the borough’s name, which translates as “place of the abundant coyotes” in the language of the Aztecs. 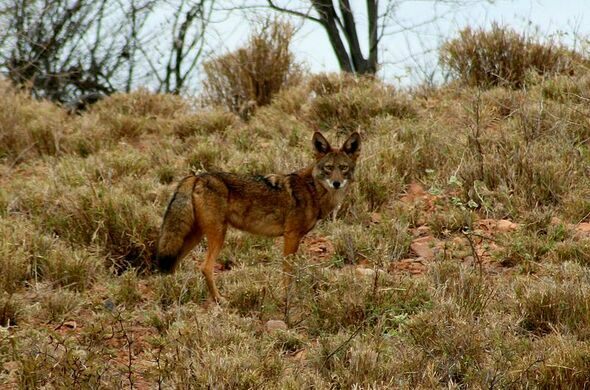 Historians have suggested that coyotes were once a common sight in this part of the Mexican valley. During the reign of the Aztec empire, what is now buildings and roads would have been covered in pine forest and scrubland where coyotes and other animals dwelt. 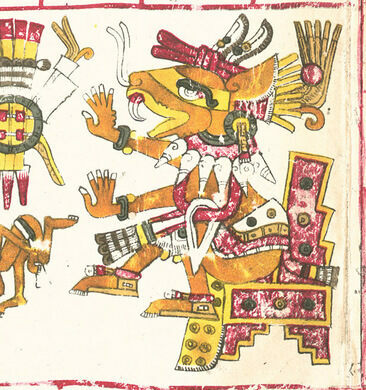 What’s more, the coyote was an animal with much significance in the Aztec cosmovision. 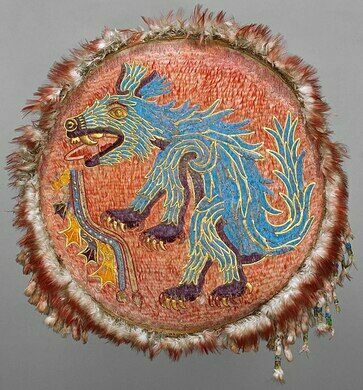 One of the most ancient Aztec deities is Huehuecoyotl, which translates as “Old Coyote.” He was seen as a wise yet hedonistic and mischevious trickster god with dualistic qualities. The coyote god was often associated with indulgent behavior, partying, storytelling, and male sexual prowess, and Aztec mythology had many folktales regarding the many beautiful goddesses he seduced. Such stories invariably feature Huehuecoyotl as a comical figure who either outwits through his cunning the angry gods that he has cuckolded or else is viciously punished by them for his mischief. Huehuecoyotl’s mischief was not just limited to the supernatural sphere of the gods; he was often believed to shapeshift into human form and roam the land causing wars and conflict between people for amusement and to alleviate his world-weary boredom. As such, the coyote god would often be blamed in times of strife and conflict. But true to his dualistic nature, Huehuecoyotl was also a god with positive qualities, and people would pray to him when they believed they had been cursed by other deities, hoping that the sly Huehuecoyotl might be convinced to trick his fellow gods into reversing a person’s fate. The Spanish conquest of Mexico did not entirely eradicate such beliefs, and in certain regions of the country, the coyote is still an animal imbued with a supernatural significance and associated with black magic. In many rural and indigenous communities, fears persist regarding the existence of a type of shaman known as a “Nagual” that through his or her witchcraft can shapeshift into a coyote at will to cause mischief and misfortune. 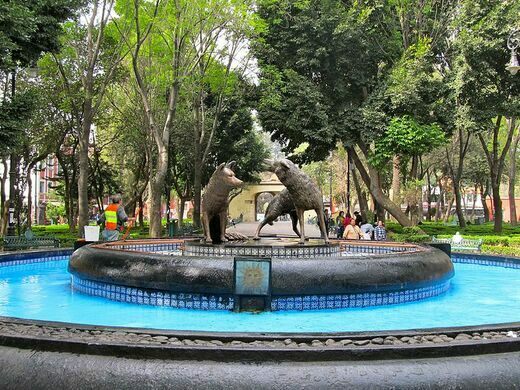 However, despite its enduring name and significance, the coyote itself is no longer found in Coyoacán, and indeed is rarely seen in urban Mexico City except in zoos. They are not quite extirpated though, and this wily animal may still be found in low numbers in the ever-diminishing forested areas of the city, such as Desierto de los Leones and Ajusco national parks. 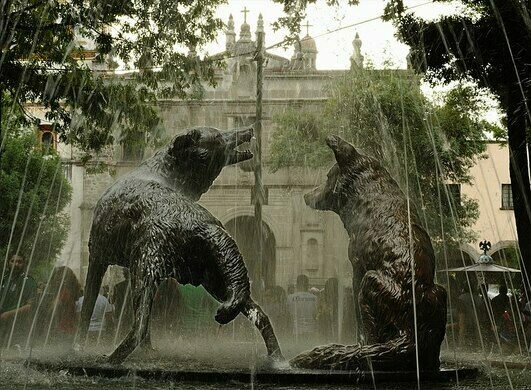 The coyote fountain is located in the center of the borough in the Jardín Centenario (Centennial Park), directly opposite the cathedral of Parroquia de San Juan Bautista.